White porcelain, painted, glazed. 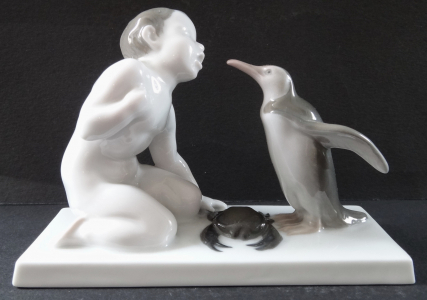 Sculpture of a gesturing, kneeling, naked child, with a crab and a standing penguin with wings open. Rectangular low white pedestal. Marked on the base, on behalf of the modeller. Below marked - Rosenthal. Germany around 1920. Draft of 1910, the name - Brotneid. Height 9 cm, width 13 cm.